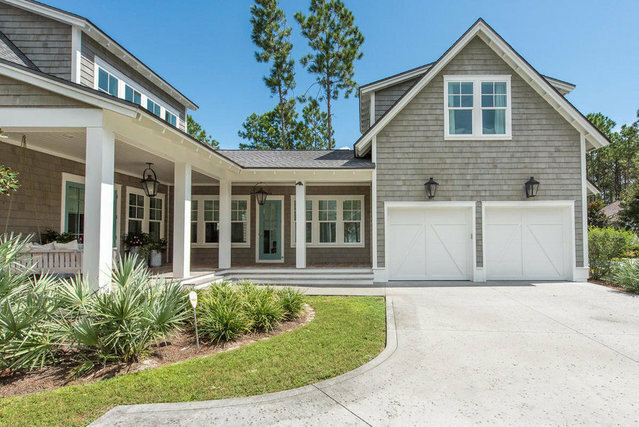 This gorgeous home located on the neighborhood of Watersound Origins golf course, welcomes owners and guests with it's large L-shaped front porch entrance. The beautiful french doors lead to the homes spacious main living area. The main level of the home boasts 12' ceilings and large windows bathing the rooms in beautiful natural light. A neutral color palette, white oak floors, designer furnishings and custom window treatments, create a bright and elegant feel. The home's kitchen is filled with top of the line finishes such as Wolf appliances, built in refridgerator, custom tile backsplash, over-sized quartz island with seating for 5, and a cozy breakfast nook with built-in benches.The living area is centered around the home's fireplace, and the back of the home is lined with a wall of windows and french doors that open to the large screened-in patio stretching the length of the home. This patio opens to home's luxurious pool and outdoor living areas. The pool features a sun deck and spa, and is adjacent to the outdoor living room complete with another fireplace, additional seating area and television. The first floor master suite features gorgeous designer furnishings, french doors to the screened-in patio, and en suite with separate sinks, stand up shower, soaking tub and spacious custom master closet.You will find a large laundry/mudroom with a wet bar and wine cooler on the first floor as well. The second floor of the home holds 3 additional rooms including a bunk room that sleeps 4.The carriage house with added kitchen sits atop the homes 2 car garage. The neighborhood of Watersound Origins has sidewalk lined streets and green spaces throughout, and offers incredible amenities including a community pool, fitness center, restaurant, golf course, walking trails, and dock with Lake Powell access. Any information contained in this listing is believed to be accurate but is not guaranteed.